The world exploded outside my window last night. Apparently there was some sort of sporting event, maybe a competition of some sort and New York won? I think? Or lost and decided to lose graciously? Yay other guys! We’re just happy to be alive! Because I do that now. I’m loving reading Eat, Pray, Love because she writes a lot about meditating (in the middle, India section anyway) and she’s both funny and moving at the same time. Although her descriptions about having a connection to God terrify me. It reminded me of when I was researching ghosts and people who record voices which they believe are the voices of the dead. I got so scared listening to these recordings that I looked around my apartment and said out loud, “If you’re here, please don’t talk to me.” That said, I wouldn’t mind having my prayers answered occasionally. Except maybe they are. I am still alive. Ooh, this dress I like. A lot. I’ve started meditating too! (sheesh. is it just the current fad?) Not as regularly as I’d like, but I found a group that meets twice a month to meditate together and talk about our experiences and stuggles with it (!). I’m determined to find at least 15 minutes a day to do it. Surely I can find 15 minutes?! Nadine, it does seem like everyone is meditating these days. What kind are you doing? I’m doing MBSR. David, ha! I was making a joke. When you basically live with the TV on 24 hours a day, even if you don’t want football it was impossible not to know what was happening. It was fun. Jackie, right? 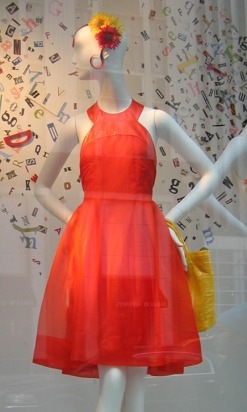 There was just one cute dress after another in the windows at Bergdorf’s. Who knew?